When searching for the perfect car seat, there are a number of different shopping tactics. You can certainly shop by your child’s age or for a specific brand, but the best option is to choose a baby car seat based on weight. The American Association of Pediatrics suggests that a child should stay in a rear-facing car seat until they are over two years old. Most modern car seats accommodate for this recommendation and have weight limits accordingly. There are two directions you can go when choosing a car seat based on weight. The first option is to buy individual car seats for each weight range. The other option is to purchase a convertible seat which will serve as your child’s car seat until they no longer need one. Each route has its pros and cons, but it ultimately comes down to individual preferences. The first step if you are going the individual car seat route is an infant car seat. These are always rear-facing and often are comprised of a base and detachable carrier. As mentioned already, the rear-facing car seat is the safest option for children two years old and younger. As such, many infant seats are rated for as high as 40 pounds and as low as 4 pounds. This range will accommodate most children until age two. As this will be the first car seat you need when you bring your child home from the hospital with you, it is important to make sure the seat is comfortable and supportive. Many rear-facing only seats also incorporate removable padding to keep the baby comfy as they grow. Infant seats also tend to be a bit more substantial than later car seats as they are built to protect infants from a very small lower weight limit. In addition to the weight, the seats also tend to be extra padded. You do not want a light weight infant loose in a car seat as it is dangerous. From this stage, you typically move to a front-facing harness seat. If your child does outgrown the weight limit before reaching two years old, however, a convertible seat may be your next best step. After outgrowing the infant car seat, the next seat to choose by weight is the front-facing seat. Most of these seats are rated all the way up to 50-80 pounds, which means this seat transitions from toddlerhood all the way to early childhood. Currently, manufacturers do not make front-facing only seats, so the best bet is a seat that converts to a booster seat. This option will also transition you into the next weight group nicely, saving money down the line. Front-facing seats come with an attached harness which is the main reason they are needed before booster seats. 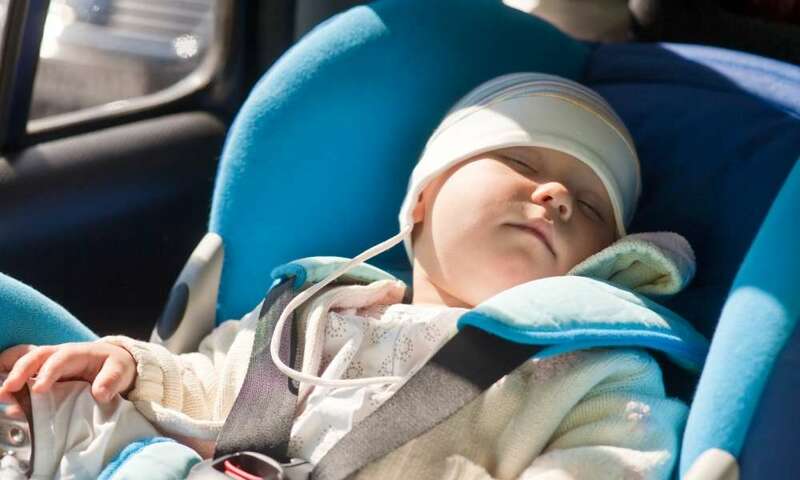 For littler children (up to 80 pounds), the harness keeps them secure in the event of a crash and ensures the belt falls in the correct place over the chest. One concern that is not present with the rear-facing seats is that the back of the car seat is not always flush with the back of the vehicle’s seat. To correct for this, until the child reaches the appropriate weight, you will need to use a tether to keep things secure. As mentioned above, many front-facing seats are convertible to booster seats which makes for a simple transition. A booster seat is used for children above 80 pounds (or the top weight limit) and is used until the child reaches the appropriate height for the regular seat belt. Though the main restriction for a booster seat is related to the height of the child, the child’s weight is also important. The booster seat is the bridge between a traditional car seat and sitting directly on the vehicle’s seats. The more important weight for a booster seat is the lower requirement. Most seats cannot be used until the child weights at least 40 pounds. This is to ensure they are large enough to use the regular seatbelt. The best option, even when your child does reach that 40 pound mark, though, is to continue with the regular front-facing car seat until the child hits the upper weight limit. This will ensure maximum safety and security for your child. If you want to forgo the many different car seat levels, a convertible car seat is also a viable option. These seats are designed to carry children from birth all the way through the booster seat stage. The more expensive seats have three or four different positions: rear-facing, front-facing, high backed booster, and backless booster seat. Each stage comes with its own weight limits. While some convertible car seats have the weight limit at over 50 pounds for rear-facing, 40 pounds is the much more common number. As the rating is higher than on typically infant seats, it can allow you to keep your baby in the safest position for a little longer. When the baby does hit that 40-50 pound limit, though, rather than having to run out and purchase a new car seat, you can simply convert the seat to a front-facing one. For some seats, the front-facing position is rated up to 70 pounds. If the weight limit is so high for front-facing, you really just have to be concerned with your child’s height for when to switch to the booster stage. When you do hit that stage, some seats have high back and backless options. If you are looking to choose a baby car seat by weight, the best option is to read the specific seat limits to decide what is best. A good thing to keep in mind when doing this is that children should sit rear-facing for at least two years for the safest option. If you go the individual seat route, you will need to purchase at least three seats during your child’s car seat years. You can also, however, use a convertible car seat to forgo switching seats entirely. While both options are viable for choosing a car seat by weight, it will come down to personal preferences. Even though the weight limits are lower, the individual seats are often safer than convertible, so it is best to read the relevant features when making a decision.